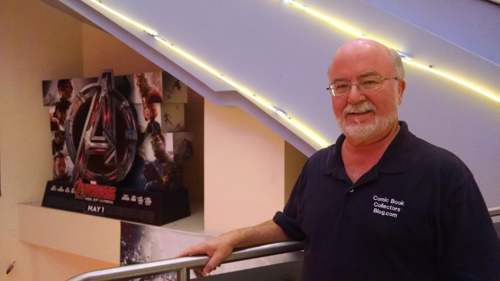 TODAY'S FEATURE IS BLOG #4056 - I'm back from seeing Part VII of the Star Wars film series. 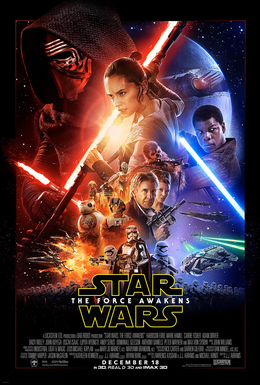 I haven't blogged or posted about this latest installment of the Star Wars films before. Sure, I was interested in going to see it on the Big Screen, but nothing made me want to go until last night. Then the first few minutes ran. Nothing exciting there for me. Actually it was kind of slow for me, even though there was a lot of action going on. It took several minutes before my interest picked up. Then there he was! Hans Solo and Chewbacca! Allright! Now the film picked up for me. I won't go in for spoiling for those of you that have not already seen it. I went not knowing much about the film. I wanted to be surprised this time. And I was! Besides Hans & Chewbacca there were: R2-D2, C-3PO, General (Princess) Leia and Luke Skywalker. It was fun seeing them all again. That was for sure! As each character was re-introduced, my interest in this film continued to grow. It turned out to be a couple of hours of fun viewing. Plus this film is just the first of two more films to be added. I'll be back for sure to see those! Like I said above, I'm not going to give away the storyline of this film. Just that if you have seen all of the previous six films, you gotta see this seventh one! For those of you that want to know a little more about the film, please see this link to the Wikipedia entry for the film. As for my grade for this film, I'd give it a VF/VF+ (Very Fine/Very Fine Plus) 8.25 out of a possible 10.0 comic book grade. It was a fun film, but just a little slow at the beginning of the film. As for the new cast members, I'd have to give a Near Mint Minus (NM-) to Daisy Ridley who played Rey. Her character development in the film was handled nicely. Looking forward to seeing more of her in the films to follow. 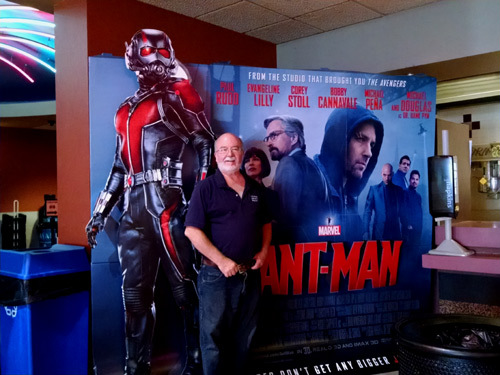 TODAY'S FEATURE IS BLOG #4035 - I am back from viewing the 2015 Ant-Man film! I've waited to see this ever since it was announced at the 2006 San Diego Comic Con International. I've waited with baited breath to see this film, as I am a fan of the original Ant-Man, Hank Pym. I missed the 'Man in the Ant Hill' story in Tales To Astonish #29 back in January of 1962. I started after Hank Pym came back in a superhero outfit as Ant-Man. That series started in issue #35 of Tales To Astonish. He remained as Ant-Man until issue #49 when he became Giant-Man. I still followed Hank Pyam and Janet Van Dyne (as the Wasp!) until they were replaced by the Sub-Mariner in issue #70 in August of 1965. There was a much later story where Scott Lang became Ant-Man. That was just okay for me. It was nice to see 'Ant-Man' again, but it just wasn't the same for me. So I kept seeing updates on the Ant-Man film. Then finally, years later... There were commercials on TV about the Ant-Man film that was coming. The commercials looked kind of good. But still... I wasn't for sure. Hank Pym was there in the commercials... But as a much older man. But then again, I've aged a bit since 1962 myself. Well today I had time to take in the film. I went to the earliest showing, and it wasn't crowded. After twenty minutes of upcoming movie previews... the Film started. There was my Ant-Man! Old film of a small person could be seen. Ant-Man! Then the story kicked in. Turned out that my interest in the film grew & grew... I was impressed with the story line. I really was impressed with Hank Pym's role in the film. This screenplay was well written! Which was surprising after the years of development in the script. See the Wikipedia entry for the film's background. Please Note: Spoiler Alert on the Wikipedia entry. It basically tells all about the film as well as the development of the film. I enjoyed how Yellowjacket was included in the film. Hank Pym had become Yellowjacket in an Avengers story many years ago. Nice touch! It was good to see Hope Van Dyne in the film. She was the daughter of Hank Pym and Janet Van Dyne. Plus her interacting with Scott Lang was good to see as well. So as you can see from the above... I really enjoyed seeing this film! Enough to give it a Near Mint (NM) 9.4 out of a 10.0 comic book grade. You can safely take your non-comics friends to see this film. The script is very well written, and the casting of the characters was excellent. It was not over the top like the Avengers 2 film was. My thanks to all that were involved with this film. It was worth going to the movies to see this film! P.S. There are over 2,400 Ant-Man stories. Click here to see where you can find them. Doomed! 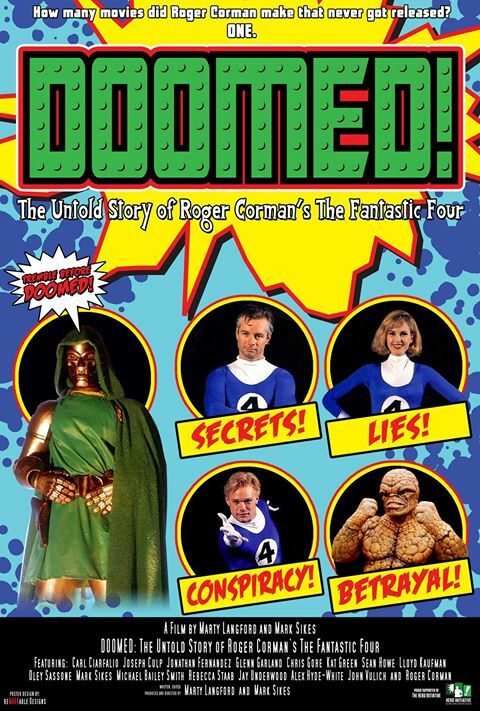 The Untold Story of Roger Corman's "Fantastic Four"! TODAY'S FEATURE IS BLOG #4032 - Yesterday I blogged about 'My Take On the 2016 San Diego Comic Con International'. There I mentioned that the 'Highlight' of the convention for me was the showing of a documentary I had interest in back in 2013. That was the time that the doucumentary was being funded by an Indiegogo fund raiser. My Facebook Friend Carl Ciarfalio, who had played The Thing in Roger Corman's Fantastic Four film, brought the fundraiser to my attention. I blogged about it, (blog #3876), and posted about on my Facebook Fan and personal pages as well. The fundraiser ended June 20th of 2013, and there had been some followup on the production. You see, the promoters of this fund raiser had needed to raise $60k to do this project right, and ended up with just $6k via the fundraiser. However, I also 'Liked' the Facebook Fan Page for 'Doomed! ', and saw there that they would be showing the documentary film at the 2015 San Diego Comic Con International. There were several of us there for the showing, and all that came were amazed at well how the documentary was put together. I could tell that by the expressions and the comments made during the film's showing. The film was well edited, and told the story on how the film was made, what promotions had been done, and how the 1994 film ended up NOT being shown in theaters. The persons in the film told their side of the story, and I was amazed at how the bits and pieces fit together so well. You see, I had met several of the actors at the 1993 San Diego Comic Con International when they did the promotion there. I also purchased my copy of 'Film Threat' where the Fantastic Four were the cover story to that issue of the magazine. I also obtained b&w photos of the actors and had them signed as well. I also later picked up a copy of the movie poster for the film at the Los Angeles Sci-Fi & Comic Show. It currently hangs in my home office on the wall. .
A few years back I met several of the actors of the film at the 2011 Wizard World Anaheim, (blog #3405), and became friends with Carl. He contributed a prize to one of the Black Fridays I held in recent years. So as you can see by the above mentions, and others that I haven't linked to in this blog... I was really excited to view the documentary at the San Diego Comic Con! I was not disappointed and it became the 'Highlight' of my Comic-Con experience so far on Friday. Nothing else compared to it during the next two days of the Comic-Con. I want to mention that the DVDs of the film are not ready for distribution yet, you can go to the 'Doomed!' Facebook Fan Page to keep up to date on that. I also want to thank Marty Langford, and Mark Sikes for their time on Friday after the film's showing. It was great meeting you guys in person! Plus it was great to see Kat Green, who played Alicia Masters in the film, as well that night! Addendum: For my ratings comparison between the actors in the 1994 FF film and the 2005 FF film, see this 2007 blog of mine. Also, see this blog link, for a scan of the FF film poster I mentioned above. TODAY'S FEATURE IS BLOG #4026 - Yesterday, Sunday May 3rd was the day that I took in the latest Marvel film, Avengers: Age of Ultron. I saw this on a regular screen, (Not 3D), during a late afternoon screening. The theater was totally full, and I sat toward the back, where I could see and hear the audience reaction to the film. There were 20 minutes of previews of coming films shown first. Among them were the upcoming Fantastic Four film - with absolutely no crowd reaction, and Ant-Man - with several moments of crowd laughter and anticipation for more. I saw no no interest for me in the FF film, as it was NOT 'my FF', so I'm not so keen in attending later this Summer. Too many changes of the FF in what the preview showcased for my tastes. So... After twenty minutes of previews... The Avengers film was screened. First, I'm glad that I 'know' the Avengers, after reading their comics in the Silver Age of Comics, and attending all of the Marvel Comics Films released so far. That's because the film took right off into action, with a capital 'A' for Action! The person I took with me to the film knew of the Marvel superheroes, but hadn't seen all of the films released. No introduction to the characters, and the film only slowed down a bit when the Avengers went to a farm / ranch. The movie had a good plotline, and the action was basically almost nonstop. The characters were used well, the storyline made sense, and all together the film was pretty good. But something seemed missing to me. Maybe I've become a littled 'jaded', but this sequel to the first Avengers film was missing that little 'something' that made other Marvel films stand out, like the first Captain America did for me. Robert Downey Jr. as Tony Stark / Iron Man - Great job in the role, as usual. Robert is Tony Stark period. Nuff Said!. Chris Hemsworth as Thor - The perfect actor for this role. So Be It! Mark Ruffalo as Bruce Banner / Hulk - I was more impressed with his role in this film. The Banner / Hulk situation was better used in this film IMO. Chris Evans as Steve Rogers / Captain America - Chris has really taken over this role. He fits my ideal Captain America character. Actually I even liked him as Johnny Storm / Human Torch in the Fantastic Four films a few years back. He also brings his character to life very well. Scarlett Johansson as Natasha Romanoff / Black Widow - Better use of her character in this film. Aaron Taylor-Johnson as Pietro Maximoff / Quicksilver - Introduced in this film... Was okay in the role. Paul Bettany as J.A.R.V.I.S. and Vision - I like him as the voice of J.A.R.V.I.S. and now especially as the Vision! Very good casting! Hayley Atwell as Peggy Carter - Good seeing her again. Not enough screen time, but it was good seeing her. Samuel L. Jackson as Nick Fury - Not as much screen time, but his role was vital in the plotline. James Spader as Ultron - EXCELLENT choice in casting. His voice is so damned spooky, it totally fits Ultron! This casting made the film far more interesting for me! If you are a Marvel Fanatic as I am, you have to see this film, especially if you have seen the other Marvel Cinematic Universe films. Period. Just be careful as to whom you take to the film, as there is no slowing down to explain who is whom, and the other background bits that are included in this feature. The matinee price where I went to was $10.25 per person, which is pretty steep for a film for the general masses. Here is a link to more on the film, (Spoiler Alert! ), if you aren't put off by knowing too much before actually viewing the film. Oh, and my comic book score for this film is a Very Fine (VF) 8.0 out of a possible 10.0 comic book grading scale. I wanted to blog about this film while it was fresh in my mind. 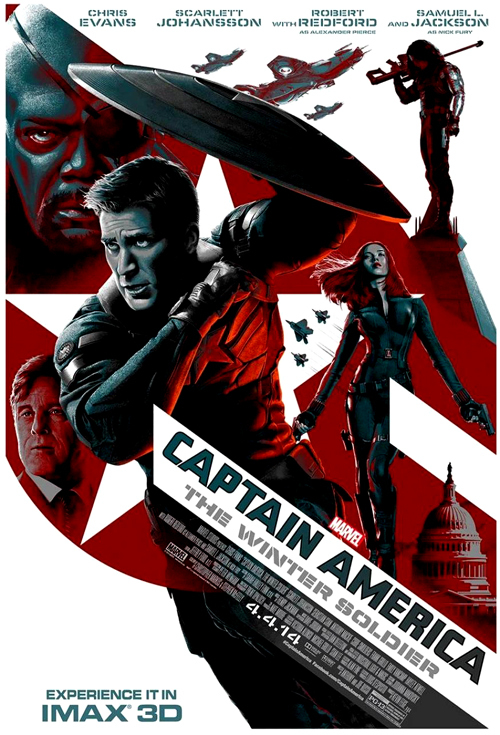 First of all, here is the link to my review on the first Captain America film in this new trilogy. You will notice that I gave it a 9.8 (NM/M) Near Mint / Mint. Unfortunately... I'm not giving this 2nd film the same comic book grade... Why? The film had a good story, and good actors. However, the total film just didn't have the total affect on me as the first film did. Possibly because the first film had a WWII background to it. This second one didn't although there were references to Cap's past. The actors were fine, and the storyline just... so-so in my viewing. There just wasn't anything that got me excited while viewing this film. It was kind of like watching the new TV Show, Marvel's Agents of S.H.I.E.L.D.. That show is okay, but nothing really exciting going on. I do watch it each week, to see what is happening, but it just doesn't jump out at me to watch it first on my DVR taped list of shows to view. I like Steve Rogers / Captain America... .as portrayed by Chris Evans. I like him more as 'Cap' than as the 'Torch' in the Fantastic Four films. He does this film fine..
Scarlett Johansson is fine as the Black Widow. I like how she is shown during the film, with more to do time wise. I don't understand why Sebastian Stan as The Winter Soldier doesn't grab me more... It just doesn't come across to me with his connection to Captain America. I understand what the connection is, but it just doesn't seem 'real' to me. The others in the film are fine also... Which is probably why I'm giving this film an 8.0 VF Very Fine grade. It just doesn't grab me as so many of the other Marvel films have. In fact for those of you that aren't into Marvel Comics... I would almost say to wait to catch this on DVD when it comes out later this year... Yeah, I really do mean that. And that after giving the first film such high marks! I'm posting the link to this blog on my Facebook Fan Page, where I ask you to share what you thought of this film if you do see in the theaters. The above is just 'My Take' on this second of the three Captain America films coming our way. The third installment is scheduled for May 6th of 2016. Oh, and if you want to see all the details of this film, the Wikipedia entry has it all, but that will take out some of the experience for you to see it on the Big Screen. NOTE FROM Michael D Hamersky On Comics: My thanks again to all of YOU reading this blog and our archived blog posts, now at 3,993 total posts in number! I do appreciate your continued reading and support of this Blog!